Minnesota Valley Lutheran High School is all about Christian education. The education we offer goes beyond religion class and chapel. It goes beyond the classes that are taught throughout the school day or the activities that are also a part of the education. Rather, the education that our students receive is one that is centered on Christ – everything we do centers on Him. MVL is a four year high school located near New Ulm, MN. It serves families by offering a Christian high school education in grades 9-12. With a thirty two year history in the area, MVL has become an established part of the community. Students come from the Mankato and St. Peter areas, from Sleepy Eye, St. James, Sanborn, Morgan, Redwood Falls; from Fairfax, Gibbon, Winthrop, Gaylord, Arlington and other cities in every direction. Please call and ask for information on how we can serve you. Minnesota Valley Lutheran High School is owned and operated by the Minnesota Valley Lutheran High School Association, an organization of Lutheran congregations of the Evangelical Lutheran Synod (ELS) and the Wisconsin Evangelical Lutheran Synod (WELS), which share a common confessional stance and practice. 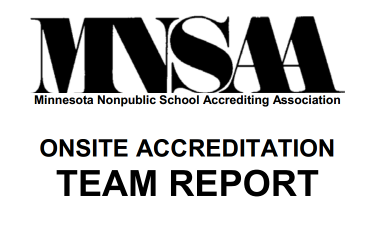 MVL is accredited by the Minnesota Non Public School Accrediting Association (MNSAA). Every seven years, MNSAA has an accreditation team visit our campus. The visitation team report is available for you to view. Please join us in giving thanks to God for the blessings that come as a result of continued accreditation.